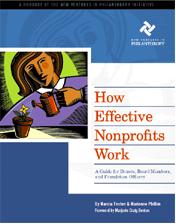 How Effective Nonprofits Work: A Guide for Donors, Board Members and Foundation Officers is an easy-to-reference primer that shortens the traditional learning curve to empower donors, volunteers and others to become active leaders in nonprofits. The book covers essentials such as assessing nonprofits' effectiveness; the roles of staff, boards and donors; and the importance of fundraising and preparation for the future. Quick takes on nonprofit strategies, structures, and best practices are interspersed with short essays. Applicable to both new and experienced nonprofit supporters, it blends practical information with analytical perspectives from experts in the field. Please note that the content of this guide has not been updated.